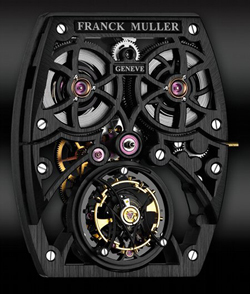 Franck Muller Tourbillon Rapide The Fastest in the World! With his brilliant ideas and imaginative Franck Muller – otherwise called Master of Complications – has always been a specialist to undermine the last few things in stride – as “the sequence of the numbers of a clock face” revolutionized the Crazy Hours masterfully described in this article. After creating the largest tourbillon ever, could the regulatory mechanism invented by Breguet still smooth pass under the hands of Franck’s most famous watchmaking world? Of course not, and even for the Research and Development department of the House led by Jean-Pierre Golay who along with his cousin Pierre-Michel Golay signed the Aeternitas Mega 4, in other words the ‘ most complicated watch in the world. Making a complete rotation every 5 seconds tourbillon Tourbillon Rapide is now the fastest in the world! Instead of executing a 360 ° turn in a minute, remaining faithful to the project filed by Abraham-Louis more than 200 years ago still behaves like most of these mechanisms, at the same time the Tourbillon Rapide speed it takes twelve . As usual by now we all know very well that a tourbillon requires a lot of energy and time constant: this “sprinter” avails itself of a 4-barrel charge. 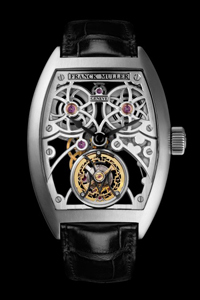 The cage mounted on ceramic ball bearings has a patented exhaust Franck Muller with the escapement wheel sets, again reversed and the balance wheel with screws without notch on the head, with the terminal curve to its Breguet balance instead confesses that despite the centuries go more than okay. With 21,600 alternations / hour, the Calibre FM 2025T and its 231 components instead they take quite calm and – the pursuit of quality rather than quantity – in spite of the four barrels its power reserve is 60 hours. To help bring a veil of tranquility is a dense network of finishes, engraving, plating rhodium, perlage, and bevel angles made by hand that although in this case are on the hunt for new records can hardly ever miss a timepiece Haute Horlogerie. The white gold case 18 k Cintree Curvex measure 55 mm x 40.65 mm x 13.70 mm, the skeletonized dial provides indications of hours and minutes. Not making the tourbillon one full turn in a minute, the second markable are obviously correlated to the movement of the cage. The Tourbillon Rapide shows how they are now very far from the time when the mechanism par excellence regulator was used exclusively to achieve accuracy and paradoxically, to date, hidden behind the back cover of the first pocket watches that were fitted. Well as its slower peers, the tourbillon world’s fastest, consistent to his “skills of caster indefinitely”, will not fail to amaze anyone who tries to follow its evolution with the look and if this rate, as it happened the jumping hours of Crazy Hours will become the new flag of Franck Muller, Mr. Master of Complications we have removed skilfully another certainty.